If you are African American and are suffering from excessive hair breakage and hair fall, then fret not. Everybody has hair problems, black hair more so since it tends to be frizzy. But it is not that you cannot achieve hair growth. With a little tender loving care, anybody can get long and healthy hair. If your hair is relaxed and you want to grow out your hair, we tell you how to grow long and healthy relaxed hair. And no, you do not have to trim your relaxed ends as your hair grows. The trick to getting your hair to grow is to provide it adequate nutrients, keeping the hair and the scalp clean and ensuring that you are not inhibiting the hair from growing at the roots and treat your hair to strengthen it. All this can be achieved by incorporating a few changes to your hair care regimen. We tell you how. To do this, shampoo your hair once in a week with a gentle and mild shampoo. Do not do it more than once a week as it can cause breakage and dryness. Try a shampoo with aloe extracts that will moisturize your hair sufficiently. Also, stay away from shampoos that have harsh chemicals like parabens and sulfates. This sounds like the total opposite of trying to grow your hair, right? Well, unless you trim your hair, you cannot get rid of the split ends. As long as you have split ends, your hair will look damaged. So talk to your stylist about chopping off nothing more than half an inch of your hair to get rid of the split ends, once every 3 months. Every time you relax your hair, your hair is losing a little bit of its protein. Since hair is mostly made of proteins, it is essential to replenish them in order to strengthen the hair. So go in for weekly light protein treatments, which involves applying a protein conditioner mask that you leave for about half an hour and rinse off. Doing this will help build up and strengthen your hair. The more proteins you feed your hair, the better it grows. Applying to much heat to your hair will cause it to deteriorate. Choose hairstyles that do not need you to use too much ironing- twists, braids and buns. Try to leave your hair as is. Also, make sure you apply a conditioner before you apply heat to your hair. Since black hair is drier than other kinds of hair, it is necessary to keep moisturizing it. Use a conditioner after every hair wash. Spray some water on your hair and use a leave in conditioner on it twice a week. This will help soften the hair and also make the new hair growth almost homogeneous with your existing relaxed hair. Apply olive oil or coconut oil to your hair ends on alternate days, in the night and tie up your hair with a silk scarf to seal in the moisture. The problem with growing relaxed hair is that the place where your natural hair meets the relaxed bit, there can be breakage of hair. So do not wait for too long for a touch up when you are trying to grow your hair. 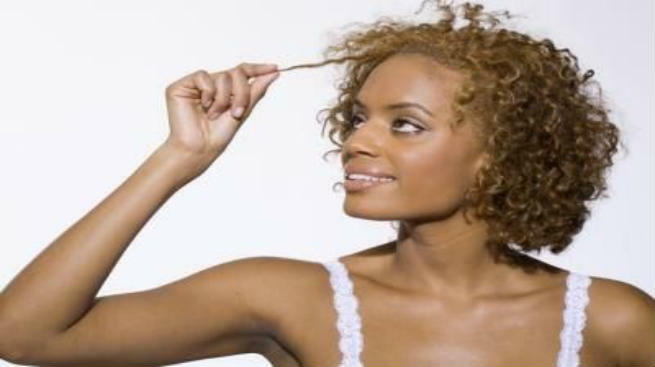 If you wait too long, then it may so happen that you could lose your newly grown hair to breakage. You know that you are subjecting your hair to chemicals by relaxing your hair. So why not try to go natural? If you are not ready to go for the big chop, since you are trying to grow your hair, then battle out contrasting hair textures for a while and see if you can fall in love with your natural hair texture.